One of the works inspired by her own children's drawings. Copyright Sara Shamma. 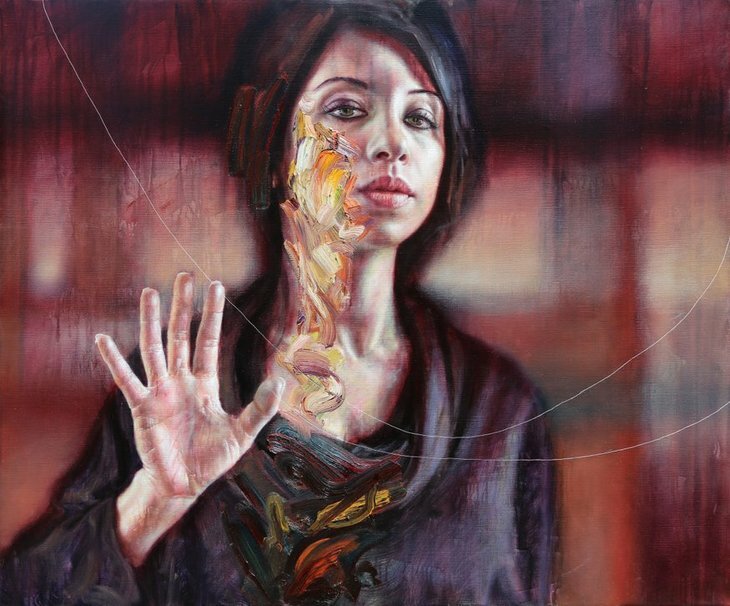 Sara Shamma is a critically acclaimed Syrian artist who left her home country when the civil war erupted. She's currently displaying work in an exhibition where the proceeds are going to help those affected by the global refugee crisis. We caught up with her to ask her about her life, art and the war in Syria. I was born in 1975 and from around the age of four or five I was already very much into art and used to draw all the time. Both of my parents encouraged my creativity. It was around the age of 14 when I thought I could become a good artist. I grew up in Damascus and at the time it was a beautiful city, a safe city, an open minded and multicultural city. It had a burgeoning art scene that was trying to find its way, by the time I was at university it was really flourishing. My mother opened an art gallery to support my work and that helped me a lot. Since the war broke out in 2011 all the galleries that I used to visit have sadly closed down. An earlier work from 2017. Copyright Sara Shamma. 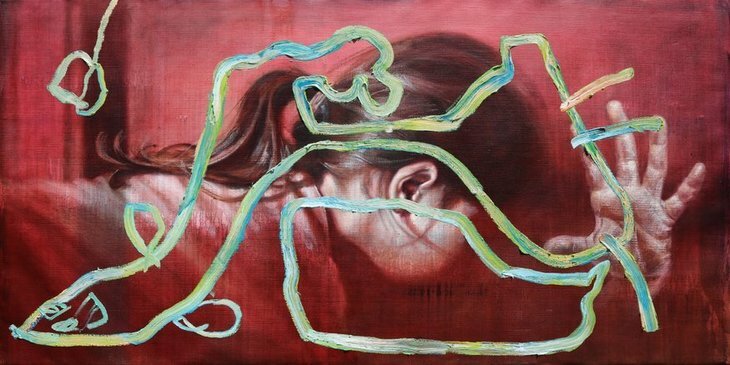 My work has always been about the human form and human emotions, that has always been my inspiration. I moved to Lebanon when the war broke out and I was emotionally affected by the war and that fed into the work I showed in an exhibition in 2015. I share everything I feel with my audience, but I don't set out to make disturbing work. Now I feel like I'm less emotionally affected by the war and I have moved on so it no longer features in my work. I find it hard to look at the work I created based on the war as it feels like I'm looking at the work of a different person — I feel like I'm a different artist now. I now live in London but it's not a city that's new to me. When I was living in Syria I used to come over to the UK regularly for exhibitions. My first UK show was in 2001 in Coventry and from then on I kept coming over regularly after that. London is my home now and I feel like a person who now has two home countries. The city is close to me — the city is a part of me, and I'm a part of it. I wanted to come over to London as it has a fantastic art scene so I applied for an Exceptional Talent visa, and thanks to letters from members of Art Fund, Royal Academy of Arts and National Portrait Gallery I was awarded a visa to come to London. I still have a studio back in Syria so I do visit regularly and my visit last Christmas inspired some of my latest works. The top image is Sara's painting in the exhibition Multicolour Art. 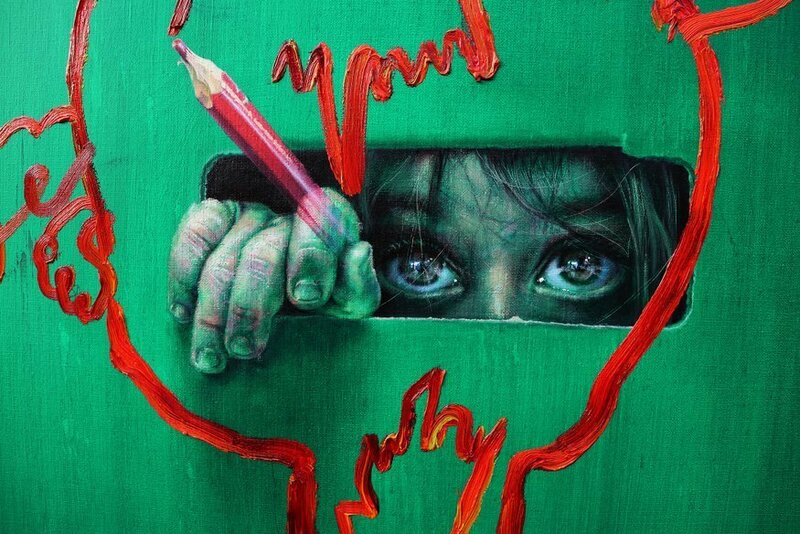 It's a project by Migrate Art where crayons and coloured pencils were salvaged from the Calais 'Jungle' refugee camp and then sent to artists to utilise. In Sara's case she gave these crayons so that her own children could draw images with them, which then inspired some of Sara's own paintings. She uses materials from the refugee crisis to both teach her own children about the plight of less fortunate children, and to create art which can then be sold to help those affected by the refugee crisis. These crayons were used by children at Calais Jungle camp to draw their dreams on paper, I am happy to re-use them to make at least some of these dreams come true. Sara Shamma's works are part of a group exhibition called Multicolour: A Project by Migrate Art. It's on display at Cork Street Galleries until 31 March and then nearby at Phillips, Berkeley Square from 4-11 April. Both exhibitions are free to visit.